NEW YORK (Reuters) - In 2014, as Jonathan Rubin and Ian Laird considered investing in the booming U.S. cannabis industry, they hit a problem: How to value pot start-ups with little verified data on the price of the weed itself? While a smoker may know the going retail price for "Strawberry Diesel" or "Buddha's Sister", the sector's wholesale tier still operates much like a black market because of ongoing federal prohibition, despite legalizations in 30 U.S. states and Washington D.C. since the 1990s. That left Rubin and Laird puzzled on the investment value of a dispensary, a weed farm or a factory making pot-infused candy. The problem spawned a different investment: The founding of New Leaf Data Services LLC, a Stamford, Conn.-based wholesale price data service that fields reporters to take on the steep challenge of cataloguing going rates. Started three years ago, New Leaf now publishes weekly benchmark spot prices and forecasts on wholesale indoor-, outdoor-, and greenhouse-grown marijuana for 17 regions with legalization laws. New Leaf makes money from about 350 pot proprietors and other subscribers who buy reports and custom analytics. It has raised money from investors who want exposure to the cannabis sector without the risk of breaking federal law. The model is roughly based on S&P Global Platts, a firm where Rubin once worked that researches and publishes wholesale prices for crude oil, fuel and other commodities such as metals or agricultural crops. The task is much harder for pot, and New Leaf's experience stalking prices sheds light on the murky trade of what might be the fastest-growing U.S. commodity, sold legally and illegally for untold billions of dollars. Cannabis firms still deal almost exclusively in cash to avoid a paper trail or because they have almost no access to banks and financial services. Because it's illegal to transport the drug across state lines, prices and available products vary widely in different regions based on whether a state has both medical and recreational markets and the number of licensed dispensaries and producers. Last week, spot prices for flower in Alaska were $5,496 per lb, while prices in Colorado and Oregon fell to historic lows of $1,008 and $1,166, respectively, according to New Leaf. Legal pot prices are also impacted by supply and demand fluctuations in the illegal market, and the spread between the two can vary. In California, regulated market prices are more than $1,000 per lb, whereas prices for illegal weed can be as low as $500 per lb, estimated Scott Davies, a California cultivator. Legal market marijuana tends to be more expensive because supplies are more restricted and because it is taxed. "Consider each state to be a different country when it comes to their laws, amount of licenses issued, what the qualifying conditions are for entry into their medical program, as well as what the political climate and current illicit market looks like," said Nic Easley, one of New Leaf's market consultants. Easley, a disabled veteran of the U.S. Air Force, said he moved to Colorado in 2006 to use cannabis to ease the pain of injuries. He's one of New Leaf's team of a dozen price experts who chase down their market data and intelligence through a network of commercial players and cannabis industry groups, such as the Oregon Retailers of Cannabis Association (ORCA). The data suppliers agree to submit weekly prices anonymously and, in exchange, get discounted subscriptions or other services. A multi-billion dollar cannabis industry has developed despite federal prohibition, but many executives, farmers and employees are still wary of federal prosecution. Davies, a farmer in Humboldt County, California - a region renowned for its premium cannabis – said growers have historically done and still do handshake deals with counterparts vouched for by shared acquaintances. Davies sells directly to dispensaries, essentially relying on the rumor mill to set prices. "It's all been word-of-mouth, through people we know and trust who are established players," he said. But the market in California - which recently legalized recreational use - is evolving rapidly and becoming more like a traditional industry, with buyers and sellers now sometimes meeting at industry events, Davies said. Market transparency has seen a boost from heightened regulations as authorities in states like Oregon rolled out legal recreational markets, said Casey Houlihan, head of ORCA. 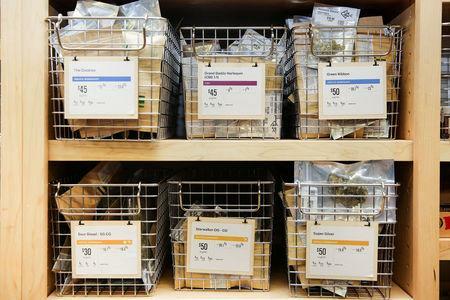 Under the new rules in that state, dispensaries must purchase cannabis from registered producers, who are required to track their sales and report them to the government. 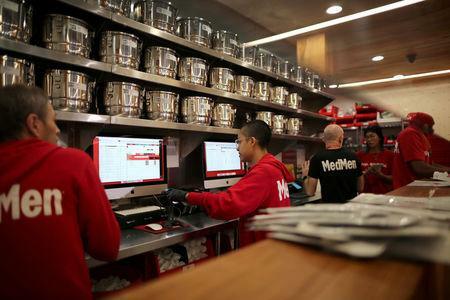 Previously, dispensaries could buy more liberally through a medical marijuana program. The data New Leaf collects is still fairly rough, and the marijuana market has nothing like national benchmark prices or futures contracts common to other legal commodities trades. There's no real way for businesses to hedge, and price-setting remains largely guesswork, said Josh Richman, senior vice president of sales and marketing for Franklin BioScience, which grows cannabis and manufactures branded products, such as mints, in Colorado, Nevada and Pennsylvania. "There isn't something where I can sell long or short," he said. The retail market is somewhat more transparent, and a pricing service called BDS Analytics runs an online database of more than 140,000 types of pot and pot products. BDS sells pricing and popularity data to retail shop owners. Roy Bingham, who co-founded BDS Analytics in 2015, is a veteran of the finance and consultancy industries. "We knew this data is really invaluable for the retail business," Bingham said. "There are people in this industry who have been in supply chains at Walmart, GNC and other mainstream operations." 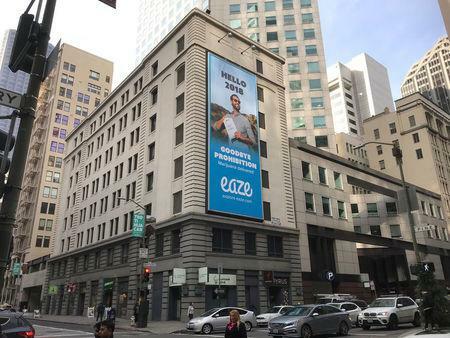 His firm collects point-of-sale data from retailers and lists the details for products such as "Blue Dream" and "Green Crack". Joseph Hopkins, co-owner of a dispensary called The Greener Side in Eugene, Oregon, uses the data to deal with suppliers. "When vendors come in and say they have x, y, z products, I can go back and look at whatever the going rate is for that product," he said. Still, the metrics are imperfect. State regulators increasingly perform quality tests to ensure safety, but no one checks to make sure that what someone is selling as “Green Crack” really matches weed branded under the same name elsewhere. The data show variations in demand for various brand among regions. For example, Blue Dream has reigned as the most popular strain for flower in Colorado and Washington since 2014. But in Oregon, tokers favor a strain known as GG - formerly "Gorilla Glue," until its purveyors got sued by the makers of the actual glue by the same name.